Welcome guys to the yearly welding contest! Are you ready to show off your skills? Today we’ll compare the cutting torch of Alien Isolation with the one in Wolfenstein. At first let’s see which one can cut a better shape. In Alien Isolation you can weld on special prepared places. It looks gorgeous but it happens on a pre-defined path! The player can choose going left or right but that’s all freedom you get. On first look it looks almost like an interactive animation. Like in Alien, you can also only weld on some exclusive areas in Wolfenstein (special metal plates). But in comparison you’re free to weld any shape you want and you’re not bound to a default path. Ha! I knew I have the better tools! But careful! There is a limitation! Yes, the mesh is divided dynamically but for performance reasons there’s a restriction in precision so that you can not cut the metal into too tiny pieces (unfortunately I wasn’t able to capture a wireframe to visualize the dynamic splitting of the metal plate). Here’s an example. On the left you can see that the cut begins at the first hole in the plate. On the right you can see that I’m not able to make a cut at the exact same place because another cut was already made really near to it. That’s the limitation – you can’t set the cuts too close to eachother. Restriction or not, at least I’m able to cut whatever I want. Hey Ripley, look! I made a 3-eyed alien! Good work Blazkowicz! Now let’s look at the edge of the welding work. 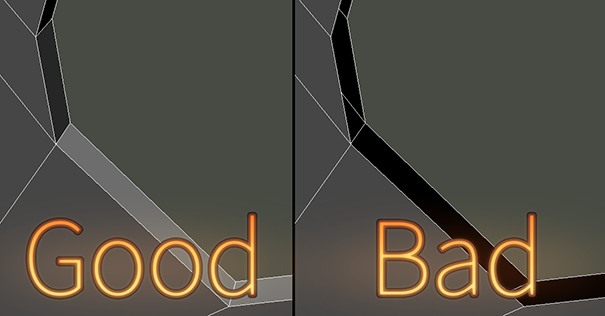 In both games poly-stripes are rendered along the way which make the edge glow very nicely. In addition to all the stunning detail effects in the curves are pretty wide so there’s no problem creating a perfect poly-stripe. By the way: the small flames are animated via a flipbook texture. The created stripe in Wolfenstein looks awesome too but seeing it side by side I must say that Ripley wins the race in this case. Especially at the corners you can see some interruptions which seem to be the price for the freedom of cutting whatever form you want. Well done Ripley! So, how do you guys handle the transition when the cut is finished and the newly created metal falls down? Within one frame the poly-stripe gets removed (the particles stay) and the new door geometry comes in. You can see that the welding edge still exists in the “new” door but is “cold” for one frame. You can see the bare metal. One frame later, it starts glowing again to act like it’s the welding edge from before. In Wolfenstein it’s similar and different at the same time. Here the part falls down dynamically as soon as the cut is finished. Notice the the newly created metal has no glowing edge anymore. But I’ve another theory how Wolfenstein did this and will show you the proof later. Not bad Mr. Blazkowicz! But now I want to see how you handle the bridging. Hey guys! Am I too late for the exam? Just wanted to show you my skillz. Thanks for reading and feel free to drop me some feedback in the comments! This entry was posted in Game Art Tricks on 2. March 2016 by Simon. Thank you for the nice comment! Yeah it’s awesome what the coders and artists come up with. Do you prefer reading or watching the content? 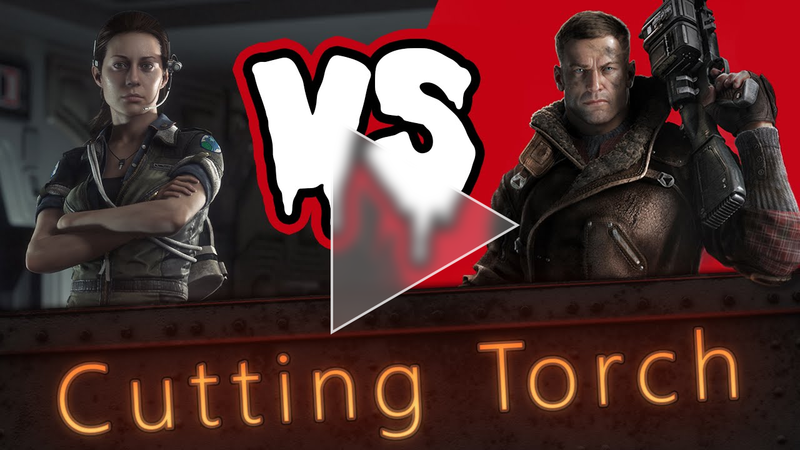 I was pretty fond of the Wolfenstein cutting but never thought so much about it. They also do it on wire!! Yea there are some underground train areas where you spend some time and you see the borders even glowing through the dark. You’d need some age value fed into the shader instance. But might be you can do it with a 1px multiply-texture strip as well. Lol, nice comparison!!! When I played Wolfenstein, I thought it used alpha testing because of hard edges, didn’t know these were true polygons. Love your blog man! brilliant! Really great that you continue posting your investigations! I often visit this page to find inspiration for my job. And even re-reading older articles brings a lot of pleasure to me! Thanks for that!